Today, I did something I never do. I took a day of vacation, but I didn't go anywhere. I stayed home and worked on unpacking boxes. Being home I was able to get a picture of the house with snow in the daylight. I put out a few decorations, like pine branches and big red Xmas balls in the window boxes. We also put candles in each window - I will have to get a photo at night of that. The living room, dining room and kitchen are now unpacked and set up. I will have photos very soon. Til then I have a picture of a bench I bought at auction back home in PA. I wanted my mom to see how perfectly it fit in the spot between the kitchen and dining room. It's the perfect place to set down bags and whatnot when you come in the door. Note Stewie sitting comfortably on my laptop bag. Thanks Stew. Hi, Jenny! I LOOOOVE your new home! It is gorgeous!!! I cannot wait to see pics. Your house looks so beautiful! Beautiful. That would make a nice Christmas card. 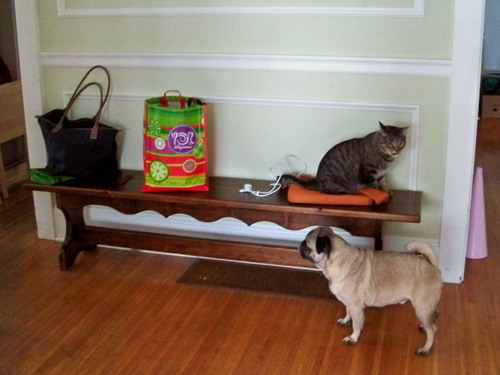 And I love the bench (and paint and trim). Martha alert! WOWWWEEEEE WOW WOW! Your new house is gorgeous! Cannot wait to see the inside. (and I rarely ever comment). Thanks everybody! 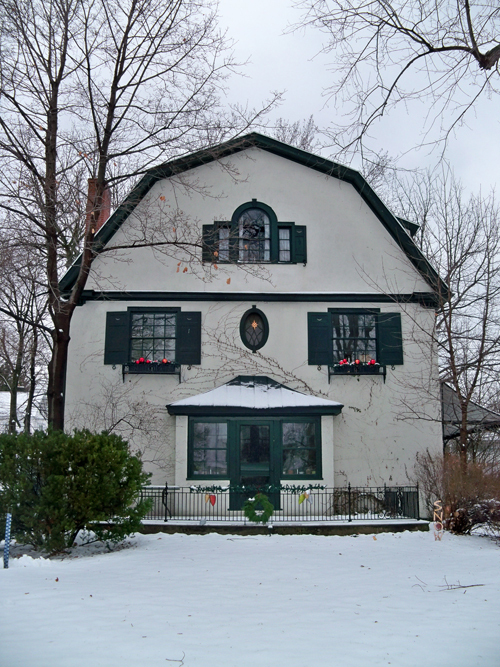 I am using a pic of the house for our holiday card this year!